Viewing time: 4 mins. 42 secs. The Write Question is a weekly video podcast all about writing. 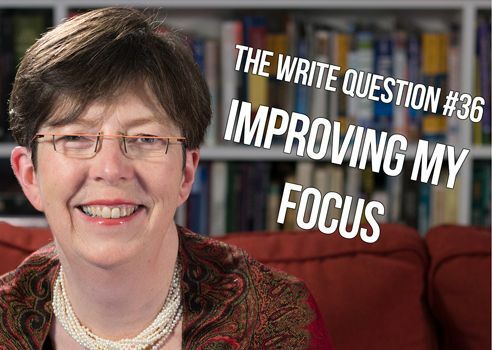 Today’s theme is improving writing focus for novelists. [recording] Hi Daphne, this is Paula. I have a question: I’m finding it difficult to focus on my book when writing every morning. I tend to do free-writing — writing whatever comes up in my thoughts. It’s more like journaling. Will mind-mapping help with this? Thanks for the question, Paula. There’s that term again — “free writing.” I think many writers get led astray by it. This technique — which requires you to write about whatever is in your mind for a set amount of time — can be a great tool but it’s not an all-purpose wrench. You can’t use it for everything! And, in particular, you shouldn’t use it for writing a book. The problem with free writing is that it doesn’t involve preparation. It’s a good tool for reducing fear and improving fluency, but not for much else. If you want more information on the limits of Free Writing, I’ve included a link below. I know your genre is fiction. A novel needs a plot and characters. Those characters must be situated in a certain place and time and they need to do things that make logical sense. And, by the end of the book, the characters must emerge from some sort of conflict that has either changed or improved them. The categories are called “plotters” or “pantsers.” Plotters plan out their novels ahead of time and they know what’s going to happen before they write. Typically, they do this using an outline although the more forward-thinking plotters will use a mindmap. (You can find my video on mindmapping in the description) Apparently, J.K. Rowling and John Grisham are both plotters. Pantsers, on the other hand, fly by the seat of their pants. They don’t make a plan in advance, but, instead, wait for their characters to tell them what to do. Apparently, Margaret Atwood and Stephen King are pantsers. Neither group is better than the other. I think it’s a bit like being a night owl or a morning lark. Human biology has made the decision and you have to live with it. Fundamentally, though, these two styles are not two different types of writing, but of preparation. Once the writing begins, both groups are still putting words on paper. They have great days when words come easily and bad days when every syllable is a struggle. Regardless of preparation style, both plotters and pantsers have to keep themselves focused on their novels. And this is why free writing is a problem. It just isn’t focused enough. If you’re a plotter, you’ll probably start with a large and detailed plan; I suggest a mindmap. You’ll need some really big paper for this — butcher’s paper or unprinted newsprint — and a big table. Doing this mindmap might take several hours or even several days. Don’t rush it. Get a plot that’s really going to work for you. If, on the other hand, you’re a pantser, you might think you should start with absolutely no planning. Instead, I suggest you begin by writing a biography of every main character in your book. This should go into considerable detail, not all of which will ultimately appear in your manuscript. The idea is to make sure you really know those characters. Then, on top of that, I suggest you do a small mindmap before every writing session. This should take you no more than five minutes and its sole purpose is to inspire you to write that day. Whatever you do, Paula, spend more time preparing and mindmapping and I think you’ll be better able to focus yourself. Thanks for your question, Paula. I hope this video helps you decide whether to consider yourself a plotter or a pantser. And you might want to think about acquiring that cat!